Sunbeam Estates is a premier, luxury single family home subdivision in Breckenridge Real Estate. Located a few blocks from Breckenridge’s Main Street and on the local bus route you have access to everything Breckenridge, CO and Summit County has to offer. There are a total of 44 parcels in Sunbeam Estates with 3 vacant lots. The 41 existing homes were built between 1992 – 2008. A couple blocks from Sunbeam Estates is the Stephen C. West Ice Arena with both an indoor and outdoor ice skating rink. Within walking distance is also the Base of Peak 9 at the Breckenridge Ski Resort. Owning a home in Sunbeam Estates gives you the option to walk, drive or take the bus to the Breckenridge Ski Resort. 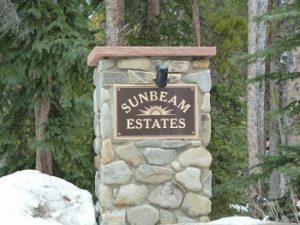 If you have been looking for Breckenridge CO Real Estate, want to be close to town but in a single family home, Sunbeam Estates is a must see. Your Summit County Real Estate search could never be easier with the knowledge, expertise and dedication to you and your search we provide. Contact Justin and Krystal Knott with LIV Sotheby’s International Realty at 970.333.9050 or visit us at our downtown Breckenridge office located at 101 S. Main Street.